View of the Copper Mill on Twickenham Common. The Duke of Northumberland's River was constructed in the 16th century to take water to Bushy Park and Hampton Court Palace, where it feeds into the River Thames. Two mills were built on this stretch of the River Crane in Twickenham. 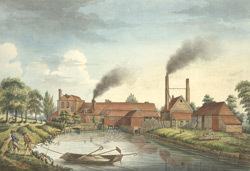 One of these mills is depicted in this picture and was known as the New Mill. It was situated at the point where Mill Road crosses the southern stream of the Crane by the former Fulwell Park. It was for a time used as a copper mill, but by 1767 it had been turned into an oil mill.